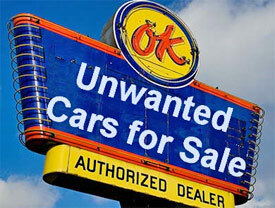 One cannot imagine used cars being marketed as "unwanted cars" or existing homes being offered as "unwanted homes". But amazingly the Unwanted Horse Coalition (UHC) has managed to define horses offered for sale and unlucky enough to be purchased for slaughter as "unwanted horses". So successful has the coalition been in promoting this strange description that when the General Accounting Office (GAO) was charged with determining the impact of the closing of US slaughter plants on equine welfare, they used the term "unwanted horses". In his article The Unwanted Horse in the United States - international implications, Dr Tom Lenz, chairman of the UHC, describes how the American Association of Equine Practitioners (AAEP), of which he is the former president, came up with the term and a definition to go with it. In the article, Lenz explains "Unwanted horses are defined as those no longer wanted by their current owner because they are old; injured; sick; unmanageable; fail to meet their owner's expectations; or the owner can no longer afford to keep them". Having established the definition, the UHC has doggedly assigned it to horses that are slaughtered each year by making statements like "over a hundred thousand unwanted horses are slaughtered each year." In fact, to a jaded person like me that appears to be the sole purpose of the UHC. However, the definition is demonstrably false. One need go no further than to look at the dictionary definition of "unwanted" and its synonyms: undesirable; unwelcome; of no value; unacceptable; objectionable; etc. Surely nobody would pay $US300 and more at auction for something that met this definition! If that is not enough evidence, then consider that in his article Dr Lenz himself actually cited proof that the definition is wrong. When discussing Temple Grandin's study of horses arriving at slaughter1, he states that "Ninety-two percent of the horses arrived in good condition." The statement was intended to show that most horses do not suffer in transport to slaughter, an obvious attempt to downplay the gruesome 900-pages of material released under the Freedom of Information Act exposing transport violations2. In fact, Lenz inadvertently demonstrated the lie that is the claim that we are slaughtering horses because they are "unwanted". Table 5 of that study, lists all of the problems with horses arriving at slaughter including behavioral issues. With the exception of those pertaining to the owner, they are the very qualities that the UHC says make a horse "unwanted". So only 7.7 per cent of the horses being slaughtered met that UHC definition of "unwanted"! But why would the UHC go to so much effort to define a term that is 92.3 per cent inaccurate? Obviously a derogatory term makes the fate of these horses seem more acceptable. But why form an entire organization for little other purpose? The answer, I believe, is that it avoids the natural and accurate description which is "excess horses". You see, the term "excess horses" must be avoided at all costs! This is because if the description is "excess horses", then it follows that the problem is over breeding and not some individual failing on the part of the horses. The horses, as it turns out, are not worthless; there are just way too many of them. The slaughter defenders cannot allow the problem to be seen to be over breeding because breeders pay the registration fees that support the American Quarter Horse Association, and other pro-slaughter breed registries. And it is these registries that fund the lobbyists, the public relations experts, the publicists and the phony welfare organizations that defend horse slaughter. The UHC was formed by experienced professionals who understood that he who controls the vocabulary controls the battle, and one controls the vocabulary by generating and continuously repeating carefully crafted definitions and catch phrases. In the hands of the less sophisticated, attempts to float terms like "horse harvesting" look heavy-handed and buffoonish. But this is not the case with the UHC and its promotion of the "unwanted horse". And the definition game does not stop there. 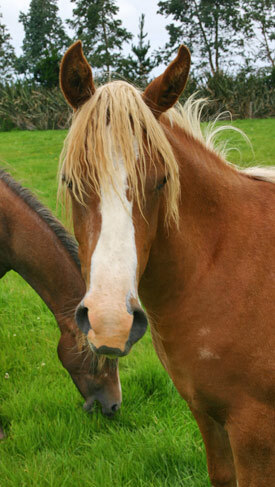 For example, there have been countless articles and stories about the terrible problem of abandoned horses. In trying to substantiate these stories, a team of our researchers called hundreds of state parks, county animal control agencies and sources listed in the stories. Almost every story was false or distorted beyond recognition. Nine horses reported in a story in the Oregonian as being abandoned on a ranch turned out to be an unconfirmed report of a single stray horse made by the rancher's granddaughter. Horses reported as having been turned loose on a reclaimed strip mine in Kentucky turned out to belong to a riding stable. State parks in Indiana reported to be counting horses entering and leaving the park to assure they were not abandoned turned out to be horses counted entering (only) so that a fee could be charged. An independent team launched a similar study to test the claims by state representative Ed Butcher that the state of Montana had a crisis of abandoned horses. They also found only a handful of stray horses in the entire state and no evidence of intentional abandonment. So why go to so much effort to fabricate a problem with abandoned horses when there are lots of true stories about horses being neglected and starved that could be hyped? Again, the answer is in who would be to blame. If the horses were abandoned, there is no way to trace their ownership, so the problem falls on the local government and slaughter may be the only answer to the dilemma. But if the horses are being underfed, there is an owner upon whom to assign blame and from whom to extract fines for the animals' rehabilitation. And worse yet, the owner is often a breeder. The same trick is being used in calling the American wild horses "feral". The modern horse (Equus Caballus), which originated in North America and spread to the rest of the world over the Bering Land Bridge, disappeared in North America about 7500 years ago3. When they escaped from the Conquistadors (and later from the cavalry and Native Americans), they were merely returning home. Inferring that American mustangs have no place on the range because they were missing for the geological equivalent of the wink of an eye is like taking a seat from a theater patron because he went to the men's room. But "feral horses", like "unwanted horses" are by the very definition worthless. And how does one fight such tactics? The only way is to pounce on their use with the derision and scorn they deserve! Never allow them to go unchallenged! The horse slaughter industry in the United States is in decline. Even Italy4, one of the largest consumers of horse meat in the EU, is considering a ban on its sale. When the new EU regulations kick in, the slaughter market in the US may collapse altogether. If and when it does, the horse industry will take some time to adjust its breeding to the new reality. We need to be prepared to help a lot of horses. By defending the very people who are causing the problem of excess horses, the UHC is guaranteeing that the transition will be worse than need be. The EWA calls upon the UHC to give up this ridiculous charade and focus on the problem of the excess horse. 3. Horsetalk.co.nz, Jan. 22, 2010. Why did horses die out in North America? John Holland is the president and a cofounder of the Equine Welfare Alliance, an umbrella coalition of more than 90 member organizations. Holland is a freelance writer and the author of three books. He frequently writes on the subject of horse slaughter from his small farm in the mountains of Virginia, where he lives with his wife, Sheilah, and their 12 equines.